With its 2747 cabins, the “Symphony of the Seas” is a real floating city: a liner almost three times bigger than the Titanic, 100m longer than the aircraft carrier Charles de Gaulle. It’s the ship with all the superlatives. 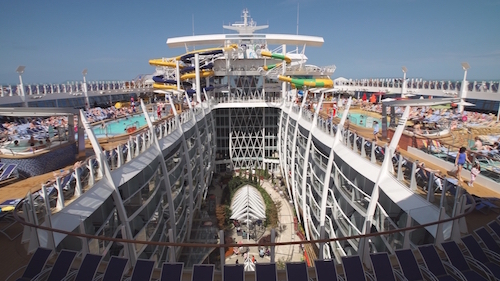 Aboard are 6,400 passengers from all four corners of the world to experience a vacation like no other. And behind the scenes are rather more than 2,400 crew members working day and night: cooks, life-guards, captains and figure skaters. For them, this cruise is no picnic. However, for the passengers nothing is spared in providing their summer pleasure: pools with breath-taking slides, a nature reserve with 12,500 plants, starred restaurants offering gourmet cuisine and fairy-tale entertainment in the evenings… On board the Symphony of the Seas, director Philippe Lafaix reveals the secrets and the organisation behind this monster of the oceans as he accompanies the excited vacationers.